고종 때의 학자 연재(淵齊) 송병선이 이곳의 아름다운 경치에 반해 은거하여 서벽정(棲碧亭)이라는 정자를 짓고 후진을 양성하며 소요하던 곳으로, 이 고장 선비들이 송병선을 동방에 하나밖에 없는 선비라는 뜻의 동방일사(東方一士)라 한데서 비롯되었으며, 푸른 바위의 깨끗하고 의젓함을 들어 일사대(一士臺)라 이름 지었다고 한다. 구천동의 제6경인 일사대(一士臺)는 굽어 흐르는 원당천의 침식작용에 의하여 발달된 하식애(河蝕崖)로, 서벽정 서쪽에 우뚝 솟은 기암은 배의 돛대모양을 하고 있어 절경이다. 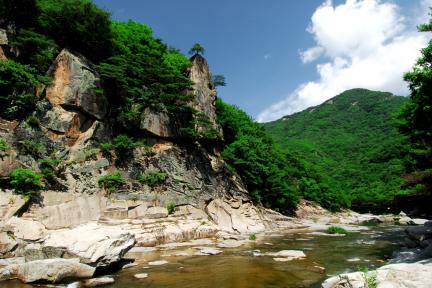 Song Byeong-seon (pen-name: Yeonjae), a scholar during the reign of King Gojong of Joseon, decided to settle down near Ilsadae Precipice out of love for the natural scenery. He built a pavilion and named it Seobyeokjeong, and taught young people there. The name Ilsadae (“Ilsa” literally means “exceptional scholar”), referring to a nearby rocky platform, is associated with him. Formed by stream erosion, the area is regarded as one of the most exquisite landscapes in the area.